In 2007, an album was released that in my eyes is one of the best electro-pop albums that I've ever heard. That album is called Galore and it's by the Canadian pop marvels Dragonette. It was such a near-perfect album that I gave it five stars in my review. However, with a phenomenal debut come huge expectations - how are you going to come up with a follow-up to such a solid album? It can't be easy, can it. Yet, "It's easy / hard as it seems" sings frontwoman Martina Sorbara on "Easy", and it kind of answers my question as well. Released in 2009, Fixin To Thrill is the group's second album and marks a slight departure from their initial, straight-forward pop-rock style. It's not like they abandon pop music here either, but they do embrace a more electronic-oriented, even indie-like soundscape on the record. Fixin To Thrill also sees a change in Sorbara's persona: whereas on Galore she represented an archetypal sultry pop vixen, here she adopts a bolder and occasionally even juvenile character, which is also reflected in the music videos and the way they portray her. Kicking the album off with a bang comes the title track and lead single "Fixin To Thrill". The undeniable powerhouse of the record is an instantly infectious dance track with edgy, almost abrasive synths and enough cowbell to keep Saturday Night Live comedians satisfied. "We'll get you something that you can't get at home" she promises, while also commanding: "Get on the floor / Don't make a fuss, just do it". It sets the tone for the rest of the album - this is a record to have fun to. It is followed by "Gone Too Far", a hilarious banjo-accompanied tune that could be described as electronic hoedown, of all things. Then things turn serious. "Liar" is a four-minute pop lyric about a situation where two people who are drawn together but they are both taken, and the song depicts the inner moral struggle: "You could feel it too, don't hide, you liar! / Some kind of thunder inside / Don't speak, don't breathe, don't touch the fire / It's gonna burn us alive". "Stupid Grin" is about a woman stuck in a bad relationship that she'd like to get out from but always falls for the guy again: "When you come home I'm gonna kick you out / And you show up with that stupid grin / And I just let your love in". The tender ballad "Easy" is one of the LP's most heart-rending moments and continues with the same theme, with Sorbara pondering "You love me like a bull in a china shop / Why do I stay if one day you'll break my heart?" Things get more uplifting with the catchy new wave single "Pick Up The Phone", one of their best singles to date. The tracks that follow it are actually more 'indietronica' than they are 'pop': "We Rule The World" is a glittery electro-pop number with charmingly naive lyrics: "We've got the superhero costumes / Know how to change our clothes in a phone booth / So let's pretend that we, we rule the world". The humorous "Big Sunglasses" assimilates fame and fortune with the titular eyewear, while the cutesy "Okay Dolore" features additional vocals by Sara Quin of Tegan & Sara. "Come On Be Good" is yet another example of Sorbara's excellence as a pop lyricist when describing the love relationships between two people: the man is scared of settling down in the fear of missing out on something, but the woman knows they're right for each other, assuring him: "You could run around forever but I got what it is you want / I'm making the taste, you're chasing a flavor". Perhaps surprisingly after all the nearly sugar-coated electro-poppiness of the album, it nevertheless ends on a pensive and wistful note. "You're A Disaster" is a melancholic piece written in waltz time signature, with the lyrics lamenting someone who's living his or her life a tad too recklessly, thus heading "faster and faster / straight for disaster". The mid-tempo album closer "Don't Be Funny" showcases some great instrumentation where the band almost completely lays off the otherwise very omnipresent synths. The last two tracks also see Sorbara channelling her pre-Dragonette singing style - before turning to saucy electro-pop she used to actually write folk music! In the end, Fixin To Thrill is a fine electro-pop record. With this playful album the band was going through a bit of a reinvention with newfound orientation towards synthpop and a more indie kind of sound. There are great killer tracks here but as an album, as an entity, it doesn't quite match up to Galore but that's mostly because the latter set the bar so extremely high to begin with - it is a remarkable pop debut filled with memorable songs after another. However, Fixin To Thrill is the sound of the band evolving, developing their distinctive mix of pop and electronica into a new direction and exploring new territories. 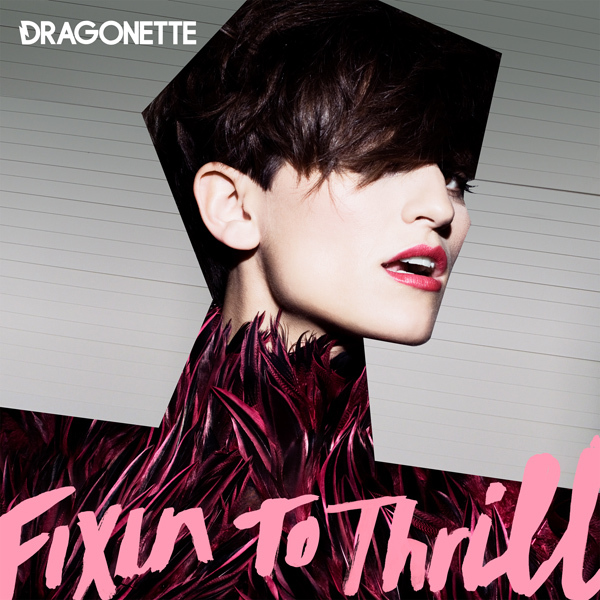 No fan of the band in question or pop music in general should be disappointed - it's rich with trademark Dragonette hooks, melodies and lyrics, all as catchy as ever! Try at least: "Fixin To Thrill", "Pick Up The Phone", "Easy", "Don't Be Funny"